Our local paper recently featured this painting by artist Ernie Marjoram. His work really captures the feel and vibe of the westside of Los Angeles: www.erniemarjoram.com. 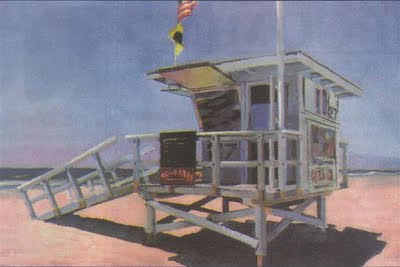 I especially like this painting of the beach and lifeguard station in Ocean Park (south Santa Monica). My wife and kids and I, along with her sister and kids, were at this same beach Saturday. Great place for kids and families. Even parking was easy (wow). I though this was an appropriate post on a day when so many fellow Angelenos will be at the beach, sort of that "last day of summer."